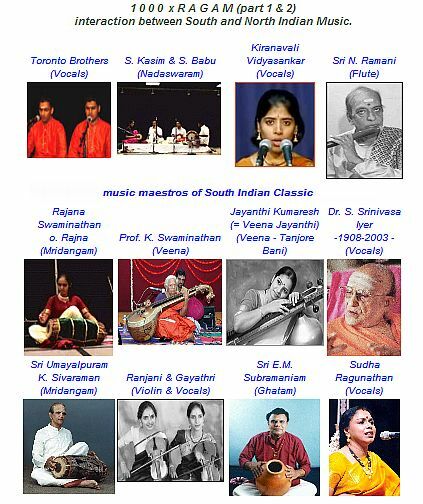 The main topic of IMC OnAir’s May and June show: “1000 x RAGAM – the relationship between North and South Indian Classics” (May: part 1 / June: part 2). With the past transmissions (since broadcasting started on 27th March 2006) IMC OnAir presents Indian Ragas as the basic form of North Indian Classic, the Hindustani music. Following a 24 hours time cyclus Indian ragas are played and listened at certain daily and night times or seasons allocated in the Thaat system of Vishnu Narayan Bhaktande, an Indian music scientist of the 19th century (1860-1936). From ten main raga-s are derived all other raga forms, the females (ragini-s) and their sons (putra-s). For a comparison with the thaat system IMC OnAir’s radio show „1000xRAGAMs“ will constrict onto the wide spread raga concept of South India, the >Melakarta system<. This entry was posted on May 21, 2007 at 4:31 am	and is filed under ENG (English), IMC OnAir - News. You can follow any responses to this entry through the RSS 2.0 feed. You can leave a response, or trackback from your own site.